After forty years of shared laughter, love, and tears, it's hard to let go. But it's time. So, fly, Richard. Wherever you are, wherever God takes you, fly high. I love you. Welcome to At All Costs. Thanks for stopping by, and I hope you enjoy the visit. Of course, writers always hope that, for a lot of reasons, including—dare I say it?—financial ones. In my case, there's also the fact that I love writing (why I do it, after all), and having people buy my books affects me much as a combination of celery and well-rubbed ears affect treecats. Besides, I've grown very, very fond of Lady Harrington over the years. I hope you have, too, and that you feel I've done her justice in this latest book. I've always seen Honor as a growing, changing individual. The mainstream novels have spanned a period of approximately twenty years as of the end of At All Costs (and taken us twelve years in our own, more plebian real life), and the Honor Harrington of this book isn't the Honor Harrington of On Basilisk Station. She's grown, changed. She's learned things about herself, and grown into new roles and new personae. The intensely focused, apolitical naval officer of the first few books has found herself a great noblewoman, a senior admiral, and a confidante of queens and emperors. She's discovered that the reward for accomplishing almost-impossible tasks with skill and integrity is to be set even more impossible tasks. And she's discovered that whatever else may have changed, she remains constitutionally incapable of not stepping up to the challenges which confront her. Those of you who have been with us from the very beginning have seen her growing and changing, facing those realizations and grappling with them. I think that's a huge part of the reason you've followed the books—because you want to see her continue to grow and change, to deal with the challenges without sacrificing her principles. Frankly, it's one reason I've so enjoyed writing them, as well. Honor is bigger than life, obviously, and yet I think there's a sort of universal resonance there. It's not just her abilities, talents, and skills which draw us to her. It's that she's who we'd like to be, doing the "right things" we want to believe we'd recognize and strive to do beside her. In At All Costs Honor confronts the greatest challenge of her career to date, commanding the biggest fleet she's ever been handed, in the most critical battles she's ever fought. The fate of the Star Kingdom of Manticore literally hangs on the decisions she makes and the skill with which she executes them. 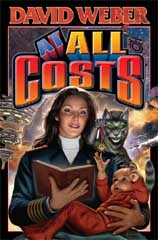 The personal price she pays is high, and the cost in death and destruction is equally terrible. Against that backdrop, her personal life changes at least as fundamentally as the carnage of the warfare she confronts. And this book, coupled with The Shadow of Saganami and Crown of Slaves, marks the beginning of an equally fundamental change in the direction of the entire series—a change which will allow the Honorverse to grow still broader and bring Honor and her friends—and many of her old enemies—together to face still greater challenges and dangers. I hope you will like this book. I certainly do, although I may, perhaps, not be the most unprejudiced judge in the entire known universe where it's concerned. Be that as it may, my personal judgment is that At All Costs is the best Honor novel at least since Honor Among Enemies or possibly Echoes of Honor, and I hope most of you will agree.